Say Happy Birthday with a tower gift! The Happy Birthday Tower of Treats is an incredible gift to send in celebration of your special recipient's big day! Creating a colorful presentation upon arrival with three boxes stating, "Happy Birthday", in bold lettering. This gift includes the following: 3-oz. Godiva® Chocolate Covered Pretzels, 6 Ghirardelli® Squares in assorted flavors, 1.5-oz. Jelly Belly Beans in assorted flavors, 3-oz. Thatcher's Caramel and Chocolate Popcorn, and 4-oz. chocolate chip cookies, and Chocolate Mocha Almonds. 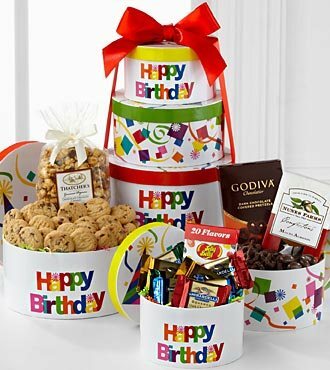 Tied with a red satin ribbon for the perfect finishing touch, this tower of treats will be a wonderful way for you to wish them the happiest of birthdays this year.